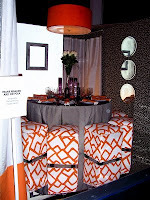 Linda Merrill was lucky enough to take part in the preview day of the recent DIFFA Dining By Design event. It took place last weekend in the Black Falcon Terminal in South Boston. Now in its 10th year, the Boston event was the last DBD event of the year. Take a look at Linda's write up and the great photos she took. Also, congratulations goes out to Linda, who will be on the board of the IFDA for 2008. Way to go, Linda! Thanks for the shout out Gradon!